Astronomers using the National Science Foundation's (NSF) 140-foot radio telescope at the National Radio Astronomy Observatory (NRAO) in Green Bank, W.Va., have discovered a highly unusual, massive interstellar cloud that appears poised to begin a burst of star formation. The cloud may be the first ever to be detected in the transition between atomic and molecular states. NRAO scientists Felix J. Lockman and Anthony H. Minter presented their findings at the American Astronomical Society meeting in Pasadena, Calif. The scientists discovered the cloud, identified as G28.17+0.05, lying along the inner plane of the Milky Way Galaxy, approximately 16,300 light-years from Earth. Observations of the cloud indicate that it is near one of the Galaxy's sweeping spiral arms, which are outlined by young stars and the massive clouds that form them. Lockman and Minter speculate that as the interstellar cloud slams into the Galactic arm, the resulting shock wave may be precipitating the conversion of the neutral hydrogen atoms into heavier molecules, which could herald the onset of star formation. "These may be the first observations of a cloud that is in the transition between the neutral atomic hydrogen and molecular phases," said Lockman. "This provides astronomers a unique opportunity to study the chemistry of very young interstellar clouds, which could give us significant insights into the early stages of star formation and the structure of the Galaxy." Interstellar clouds that contain neutral atomic hydrogen, called HI (H-one) clouds, are thought of as giant, cold blobs of gas. Researchers study these objects because they offer intriguing glimpses of the composition of our Galaxy and the cosmos, and reveal much about how stars and planets are born. Hydrogen atoms in these clouds give off natural signals (at the 21-cm wavelength), which can be detected only by radio telescopes. The scientists discovered that this HI cloud was unusual in many respects. First, it was uncharacteristically massive, about 500 light- years across and containing nearly 100,000 times the mass of the sun in atomic hydrogen. The gas in clouds this large and massive has typically undergone the transition to the molecular phase, and has begun making stars. The size and mass of this cloud indicate that it is gravitationally bound, which means that it should be collapsing and forming new stars. "When you find a cloud that is as massive as the one we detected, and one that is gravitationally bound as this structure indicates, then you would expect to see areas of star formation," said Lockman. The scientists were able to identify a few indicators of star formation, but not at the rate that one would expect. "We think we have caught something in a special state." Lockman said, "It could be one of the missing links in the cycle of star formation." The core of the cloud also gives off radio signals at 1720 MHz from the molecule OH in an unusual state of excitation. 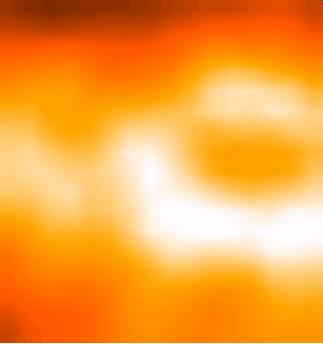 Since other astronomers have detected similar signals throughout the Galactic plane, the researchers believe that these emissions may be an indication that this previously undetected type of cloud may turn out to be fairly common. "We suspect that this cloud may be the first example of an object that may be fairly common in the inner Galactic plane," said Lockman, "but has not been recognized. That is, a cloud that is observed while entering a spiral shock and is in the transition between atomic to molecular hydrogen." The scientists caution, however, that additional research is needed to confirm their speculations. "The presence of anomalous OH through the Galactic plane does suggest that other clouds of this nature can be detected," said Lockman, "and it would be particularly valuable if a similar cloud could be detected entering the 'spiral shock' on the opposite side of the Galactic center." The patterns of velocities of atomic and molecular gas should be reversed there, due to the difference in galactic rotation. Such a discovery could help to validate the possible interaction among the spiral shock, atomic hydrogen, and star formation. 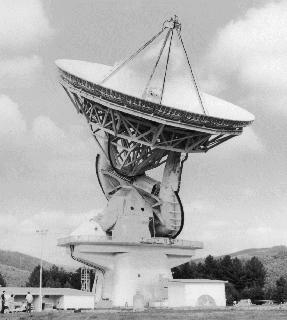 The NSF's 140-foot radio telescope now is decommissioned after a long and highly productive career. Research will continue on the newly commissioned Robert C. Byrd Green Bank Telescope, which is the world's largest fully steerable radio telescope. "Though the 140-foot telescope enabled us to make remarkable observations," commented Minter, "we anticipate that the new Green Bank Telescope, with its increased sensitivity and better resolution, will enable us to see more clearly the nature of this peculiar object." In addition to Minter and Lockman, other astronomers involved in this research include Glen I. Langston, NRAO; and Jennifer A. Lockman who was a student from the College of Charleston, S.C., at the time the research was conducted.